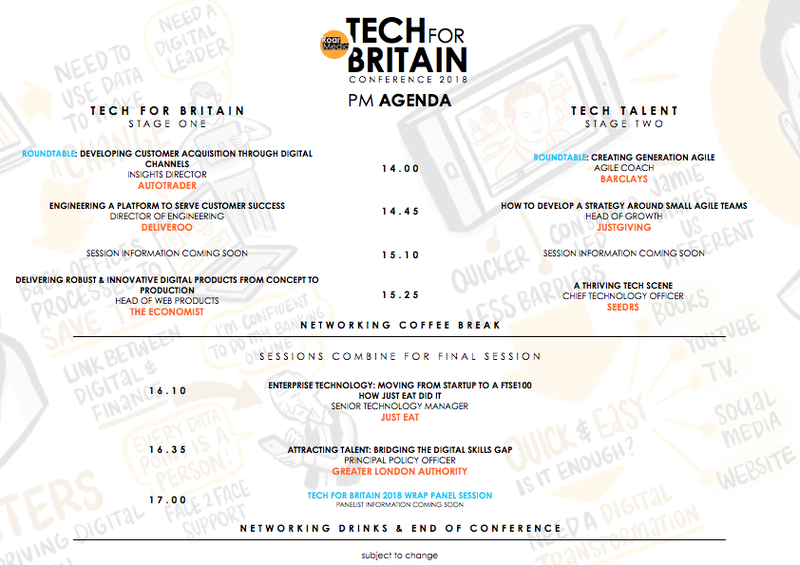 The Tech for Britain 2016 conference will bring together those working in the UK technology sector for a day of education, inspiration and innovation. 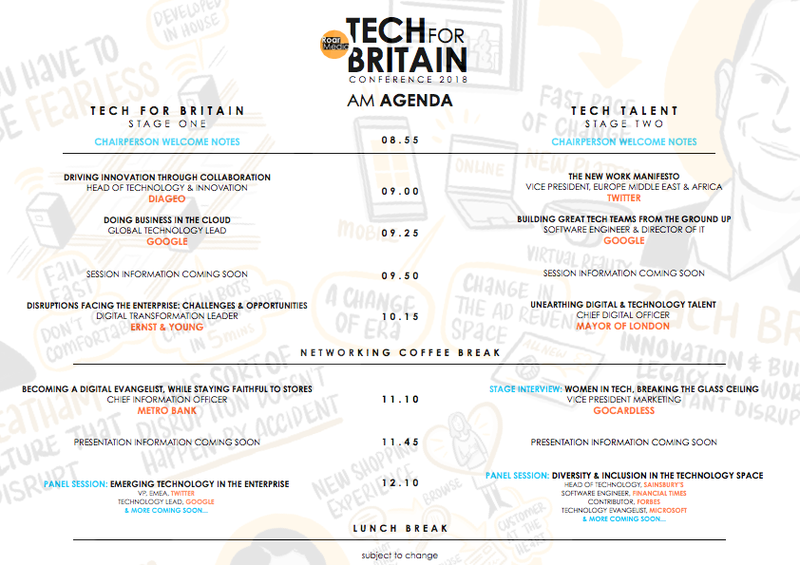 The Tech for Britain 2016 event is a celebration of the growth of the UK tech arena featuring UK leaders in the space, the event will focus on the UK vision, women in tech, fintech, cybersecurity and so much more. The event will also play a huge part in networking for the tech community. "the business application of enterprise technology and building better tech teams"
Our 2018 conference was a sell out - join us in 2019, stay updated for event launch! "It's great to bring similar people across the tech industry together and to share some of the challenges and successes we are all facing. It was extremely well organised, brilliant location, expectations were managed throughout, and for newcomers we were made to feel very welcome"
Further information on our 2019 Tech Summit will be announced early-Summer. Speakers are added weekly until the end of May, check back or stay updated for more! If you're interested in participating as a speaker there may still be available sessions, please contact Chris on chris@roar-media.co.uk for further information. Bruce Daisley is in charge of Twitter across Europe, the Middle East and Africa. In this presentation Bruce will explore the science of the science of work culture in the tech sector. The digital revolution has changed our approach to work and with that our work culture is fast changing and we need to adopt to keep a productive workforce in operation. Expect insights into the productivity paradox, happiness at work and becoming a better driven workforce. Who is using emerging technology in business, making a real difference and improving customer experience? In this presentation Nick will take a look at the current technology landscape and dive deeper into the tools and technologies that are actually proving to be successful in business. In Nicks mind there is too much time spent on diving hard into tech trends and leaping on buzz words that might not work for you. Digital transformation is all well and good but what many of us tend to see, when this happens, is additional complexity. More things to do and actually, it isn’t easy. How do you make your workforce strategy sustainable? - A multitude of Applicant Tracking, marketing, on-boarding and employee engagement applications have not succeeded in spectacular ways to create an execute a sustainable workforce strategy. Deciphering the single bullet that will crack your talent acquisition challenges has seen billions of dollars being invested with little return. What do organisations that boast of successful HR transformation do differently, is it continuous learning, abandoning performance reviews or does the answer lie in deeper realms, the psychological body-mind-purpose complex of your human workforce? Join us in this session for a scintillating debate on what we are witnessing in the space of sustainable workforce strategies. In this live stage interview we explore tech culture in greater detail from a leading woman in tech. Over the past year, our digital teams at The Economist have been thinking more deeply about how we can build products and experiences that subscribers love. After a year of experimentation, a little bit of chaos and a whole lot of fun, here are some of the biggest lessons we learned. Danny Denhard is Marketing Director at JustGiving, the world’s most trusted giving platform, and is part of the leadership team helping to drive growth and shape the company’s future. He's particularly passionate about crowdfunding and its potential for growing the world of giving. With over fifteen years’ experience both agency side and in-house, Danny enjoys speaking at conferences and mentoring others through hosting social media and digital masterclasses. As a previous business consultancy owner Danny advised start-ups and trained a number of challenger brands around growth, social media and organic marketing. Cloud computing is most often described and discussed within the context of its manifestation as a technological innovation. Mark will argue that this is, however, it's least interesting aspect. Instead, he will attempt to convince you that its most important aspect is its manifestation as a financial innovation -- as a way to acquire IT capacity in commercially revolutionary ways. Along the way, he'll review the milestones in that alt-history of the development of cloud, and dive into the murky details of various pricing models, discount schemes and the like. At the end, you'll understand that the key to leveraging cloud is to understand how to exploit these things in your own business model -- whether that's enterprise procurement or a scrappy startup, or anywhere in between. In this presentation Ross will look at how Just Eat choose enterprise technology to allow them to focus on getting things done, at pace, and with a laser-like focus. Ross will cover the reasons we choose certain enterprise tech and how it allowed us to grow at such pace moving from a startup to a FTSE100 company. The Tech Talent Charter (TTC) is a commitment by organisations to a set of undertakings that aim to deliver greater diversity in the tech workforce of the UK, one that better reflects the make-up of the population. Signatories of the charter make a number of pledges in relation to their approach to recruitment and retention. Although it is very much an employer-led initiative, in March 2017 the TTC was supported in the government’s policy paper on the UK Digital Strategy. In this presentation Benjamin, Head of Technology and Innovation at Diageo will look at Diageo's approach to future proofing its business and unlocking growth by collaborating with external disruptors in the start-up ecosystem. Creating the first in-house agile software development team in an enterprise which has adopted an entirely outsourced IT model has been a challenge. In this presentation I will discuss how we have attracted the right people, created the right working environment and more importantly achieved integration but not assimilation. As Principal Policy Officer for Digital & STEM Skills at the Greater London Authority, Doniya is tasked with delivering the Mayor’s digital skills manifesto pledges and developing a strategy to ensure Londoners have the opportunity to learn vital digital skills. In her presentation, Doniya will outline the Mayor’s current and future digital skills plans, and there will be an opportunity to pose questions to her. Over the last couple years, Google has expanded its Apprenticeship programs to offer both IT and Software Engineering roles. Each new program required researching the apprenticeship landscape, building department support, making a number of decisions with internal and external collaborators, and measuring impact. As we experienced successes and pitfalls, we built up a playbook of what to expect when introducing technical apprenticeships to your company. In 2012, Seedrs launched the first equity crowdfunding platform regulated in the world. Since inception, the platform funded to 620+ deals and transacted over £370M. Ricardo will explore the top 5 challenges companies like Seedrs can face in their path to be a growth stage business and how to overcome them. Last year, the FT started 4 employee-led internal membership communities last year to support its diverse workforce; FT Women, Proud FT (LGBTQ), Embrace (BAME) and Accessibility (for persons with disabilities). These groups can have a big impact on the culture within an organisation. Their aim is to help employees feel supported and valued at work, and also to improve our overall diversity and inclusion goals. I'll explain how we got these groups off the ground within the space of a few months, talk about the lessons we learnt, and outline recommendations for other groups. Heading-up the Delivery group, consisting of teams responsible for getting stuff from A-to-B efficiently, quickly and reliably throughout the world. Tom will offer insights into how Deliveroo use technology to deliver a seamless CX experience. Roar Media have global experience in the technology events space, their focus now is on the UK digital and technology space bringing together the brightest minds in the game to come together and collaborate educating the fastest growing industry at current in Britain. • Roar Media Ltd and ‘Tech for Britain’ helps businesspeople (our Users and Event Attendees) find relevant content, improve their skills, find suppliers, build their knowledge, and stay up-to-date. • Roar Media Ltd and ‘Tech for Britain’ helps organisations (our Clients) share or syndicate business content online and at live events. • Roar Media Ltd and ‘Tech for Britain’ helps organisations (our Clients) identify and contact businesspeople who may have an interest in their products, services, expertise, or content. roarmediaevents.com techforbritain.co.uk digitaltransformationconf.co.uk digitaltransformationmanchester.co.uk is operated by Roar Media Ltd (referred to here as “we”, “us”, or “Roar Media”). roarmediaevents.com & Roar Media Ltd services may redirect you to, or contain links to, third party websites or other digital properties. This policy does not govern the disclosure of any information by you to third parties. We have a legitimate interest in processing your data to operate roarmediaevents.com techforbritain.co.uk digitaltransformationconf.co.uk digitaltransformationmanchester.co.uk as a commercial service, and to provide marketing or advertising services to our Clients or partners. When we rely on this basis, we only process your data as necessary to achieve it, and we always consider and balance your interests, rights and freedoms against our own. inside or outside of the EU. Data provided to third parties by Roar Media Ltd will be protected by contract and applicable UK and EU law. If data is transferred outside of the EU, it will be subject to the safeguards and standards set out by the GDPR. If you have questions or complaints regarding your rights, this policy, or our handling of your personal data, please contact us by email at hello@roar-media.co.uk or write to us. If you feel we have not responded to your complaint satisfactorily, you may contact the UK Information Commissioner’s Office. We never pass on your information to a third party unless the party is directly involved within the event. An example being that an event participant might contact you after the event has taken place as a follow up. This can be removed at the request of the sender in this case. Once you have registered or downloaded the brochure Roar Media might contact you with monthly newsletter, upon receiving the newsletter you can of course unsubscribe as to not receive the newsletter.